With the 4th of July just around the corner I was trying to think of what I could take to our family picnic that was tasty, economical and would feed a lot of people. That’s when I came across a deviled egg macaroni salad recipe. I love a good classic macaroni salad, but I also love deviled eggs. So adding just one extra step of mashing the yokes before making the dressing really kicks a simple macaroni salad up a notch. 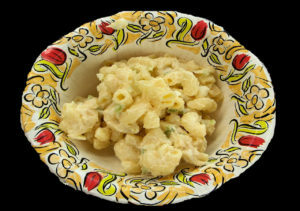 I did some more searching and was surprised that a lot of the recipes for deviled egg macaroni salad weren’t much different than the way I make macaroni salad and chopped the eggs but didn’t mash the yokes. After all, it’s the mashed yokes mixed with the mayo and spices that make deviled eggs taste so good, so that is just what I did. This is my own deviled egg macaroni salad but if you have your own way of making deviled eggs then you could easily adapt it and make it your own. I just mixed up the deviled egg mixture, increased the mayo and added some sweet pickle relish for a little kick. Cook pasta according to package directions. Immediately rinse with cold water, drain and set aside. Meanwhile, peel hard boiled eggs and rinse well to remove shells. Slice eggs lengthwise, remove yolk and place in a medium bowl. Chop egg whites and add to macaroni along with the celery and onion. Mash egg yokes with a fork then add the mayo, mustard, salt, pepper, paprika and relish. Stir well until combined and mixture is smooth. Fold deviled egg mixture into macaroni mixture (add a little extra mayo if needed). Once combined sprinkle with paprika if desired. Cover and refrigerate at least two hours before serving. 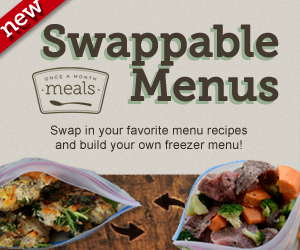 Tip: This would be an easy recipe to experiment with and make your own. If you prefer using Miracle Whip salad dressing instead of mayo in your deviled eggs then I bet it would come out great in your macaroni salad as well. In fact, I might just make it that way next time. I also plan to experiment with a deviled egg potato salad.